I guess mistletoe is supposed to be a plant, but that's what everyone is expecting! Plus, it's kind of a parasite. Who wants to support that needy behavior? Think of an unfried brick of scrapple like a fresh jar of Play-Doh. Mush some scrapple around string, hang it over the doorway, and you'll be good to go; the envy of all your Christmas-partying friends. 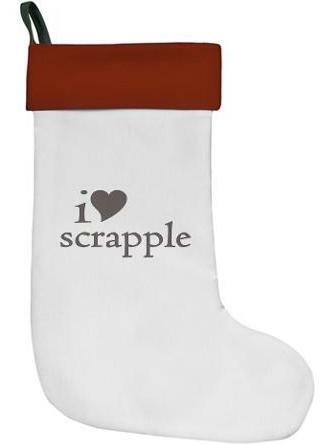 Bonus: The scrapple mistetoe can be "recycled" as breakfast the next morning. Yeah, scrapple is most enjoyed with the main course (or even as the main course). But what's wrong with adding a little sweet to this savory dish? For example, there's various ways to make Apple Scrapple Pie and all of them look...uh...delicious...? Almost as delicious? 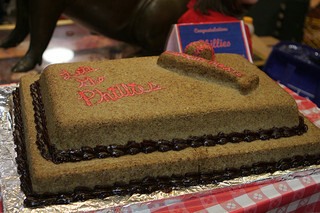 Scrapple cake -- see photo to the right. Don't you want to just dive right in to that scrapple cake with a knife and start slicing up a few pieces for yourself? No? Well, more for me then I guess. These are just a few possible ideas, but you tell me: How does your family incorporate scrapple into their Christmas celebrations?